After recognizing a training deficiency about eight years ago, I began teaching a class called, “Off-Duty & Concealed Carry Tactics for Law Enforcement.” The class covered equipment selection, marksmanship and live-fire exercises specific to the types of situations law enforcement officers could face. To this day, I am still amazed by the number of officers who tell me this was the first time they had ever trained using everyday clothing and concealed carry equipment. While frustrating, this is hardly a surprise. In more than 23 years as a law enforcement officer, I have never received department sponsored training for off-duty or plainclothes carry. I suspect it’s the same for the vast majority of law enforcement officers. Since this is our reality, and we need to be active participants in our own defense, it is our responsibility to take up the slack and seek out the necessary training for ourselves. With that, let’s take a look at some of the training issues concerning off-duty and plainclothes carry for law enforcement professionals. The majority of law enforcement firearms training consists of going to the range wearing traditional duty gear, using traditional duty weapons and performing drills primarily designed for uniformed patrol. But, those of us in plainclothes assignments, such as administrative or investigative positions, are missing out on relevant training opportunities. Many departments authorize and encourage officers to carry off-duty; however, very few departments provide training on the use of smaller, more compact handguns and the associated equipment commonly used when not in uniform. Designing an effective training program is going to be somewhat dependent on the gear we choose to use. The type of handgun, holster, magazine carrier, and cover garments provide a basic roadmap for our training needs. When it comes to handgun choice, there are many good options available for plainclothes carry. Both semiautomatics and revolvers can be effective choices –depending on your operating environment. As law enforcement officers, we train using full-size duty guns. Because of this, for consistency and ease of training, it’s generally a good idea to select a concealed carry handgun which utilizes the same operating system as your duty gun. Since these smaller handguns are more difficult to shoot well, we should take advantage of the training which we already perform using similar full-size guns. Another important consideration is that, although smaller and lighter handguns are easier to conceal and more comfortable to carry, they also have less grip area. For those of you with giant paws, these will scarcely leave room for your ring finger, let alone your little finger. When your little finger isn’t part of your grip and the overall weight of the handgun is significantly lighter, there will be greater muzzle flip during recoil – resulting in less control and slower follow-up shots. This brings us right back to our training issue. There are numerous holsters available for off-duty and concealed carry use. Many are suitable in design, function and durability for plainclothes carry. Some may be better than others depending on the context, individual preferences and the environment where they are used. Inside the WaistBand (IWB), Outside the WaistBand (OWB), ankle holsters, pocket holsters, appendix carry, and many other holster types are available. Whatever style you choose, the holster must be comfortable enough to wear on a daily basis. If not, you eventually won’t use it and, perhaps, not carry at all. Belt mounted holsters commonly fit into two categories: OWB and IWB. OWB holsters are generally more familiar to officers. They also keep the handgun further away from the body, making them more comfortable. From a shooting perspective, OWB holsters allow for better access to the grip allowing for an unimpeded draw. The downside is that OWB holsters can be less concealable. IWB holsters are more concealable and can be worn with a wide variety of clothing options. These holsters tend to “print” less – reducing the obvious bulge caused by a cover garment draping over your holster and handgun. The drawback is that the holster and handgun can press against your body and rub against (and irritate) your skin. The tight fit can also make it more difficult to obtain your shooting grip. Again, this is why training becomes so important. When it comes to cover garments, there is a plethora of clothing options available. Fashion choices include a wide variety of vests and shirts specifically designed to allow quick access to handguns, pants with built-in holsters and undergarments designed for concealed carry. For most situations, clothing which doesn’t scream “Cop!” is going to be your best choice. Don’t forget the suspension system – a quality belt designed to hold the weight of a holster and handgun will make carrying a concealed handgun much more comfortable and secure. When you invest in a quality holster, make sure you buy at least one quality belt specifically designed for concealed carry. Your handgun will be more secure, and your hips and back will thank you. Once you settle on a handgun, a holster and clothing options, it’s time to begin training with these choices. Since using new and unfamiliar equipment increases the risks of a mishap, it is best to begin training with your concealment equipment using dry fire drills. This is especially important when it comes to holstering due to the increased chances of unintentionally muzzling yourself. Before you begin, remove all live ammunition from your training area. Ensure your pistol is empty and then check it again. Once you’ve confirmed your pistol is unloaded, you can safely begin dry fire practice. It’s important to spend time doing both a two-handed and a one-handed draw. Don’t forget to use each of your holsters, spare magazine carriers and clothing options. If you opted for at least one IWB holster, you will need to work drawing from under a concealment shirt with one- and two-handed draws. Don’t forget to practice two-handed and one-handed holstering, too. 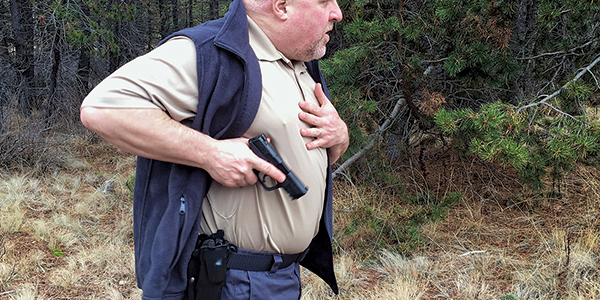 Keep in mind, when using concealment gear, there are a lot of good reasons to be fast coming out of the holster, but few reasons to try to be fast back to the holster. Once you’re comfortable with your concealment gear in a dry fire environment, it’s time to hit the live-fire range for marksmanship work. With smaller handguns, your shooting platform and trigger skills become even more important. Since you have less grip area, you will need to focus on stabilizing the gun as much as possible during the trigger press. After you’ve become familiar with applying fundamental marksmanship skills using the smaller handgun, you should run some practice drills simulating circumstances which you could reasonably expect to encounter while carrying concealed. Drawing from the holster, reduced time constraints, reloading, target transitions, communicating, and positional shooting need to be addressed. Train to draw and shoot one-handed while simulating pushing a loved one away from danger. Or, simulate pulling them behind you in order to shield them from danger. Reloading smaller handguns leads to another set of factors we normally don’t think about when using our full-size duty guns. The smaller grip area of our concealed carry guns can make dropping an empty magazine more challenging. It’s not unusual for larger hands to hinder the empty magazine from dropping free of the magazine well. And, slamming home a fresh magazine can lead to a wakeup call when your hand gets pinched between the frame and the new magazine. It’s also essential to invest some of your training time deploying our law enforcement credentials to prevent the tragedy of “blue-on-blue” shootings. Even when working a plainclothes assignment, if you get involved in an arrest or a shooting, responding officers may not recognize you out of uniform. This is even more critical if something occurs outside of your normal duty area. When you’re out of town, no one will recognize you as a police professional, so you need to behave accordingly. Here’s a partial list of topics for training off-duty and plainclothes concealed carry: drawing from under a jacket or vest; drawing from under a shirt; two-handed draw; one-handed draw; two-handed holstering; one-handed holstering; applying fundamental marksmanship skills; one-handed shooting; empty/slide-lock reloads; tactical reloads; multiple targets; positional shooting; shooting from cover; developing speed and combat accuracy; and deploying our LE credentials after engaging. In today’s world, law enforcement officers should be carrying off-duty whenever, and wherever, possible. To responsibly carry in plain clothes, we need to invest in the proper equipment, clothing and training. Even if agencies fail to allocate the time or money to train officers to carry in plain clothes, we need to take responsibility for our own well-being and train for this reality. We owe it to our friends and family to be prepared for plainclothes or off-duty encounters. Todd Fletcher is a sergeant in Central Oregon with over 22 years of law enforcement experience. He has presented firearms and instructor development training nationwide and at multiple regional, national and international conferences. He owns Combative Firearms Training, LLC which provides firearms training and instructor development classes to law enforcement, military, private security, and armed citizens. He can be contacted at Todd@CombativeFirearms.com.